The miniature is primed with white. The first highlights of the face are applied with a mixture of Bering Blue SC-06 and Violet SC-56. Adding Inktense Violet SC-82 to the mixture we appy a first shading. 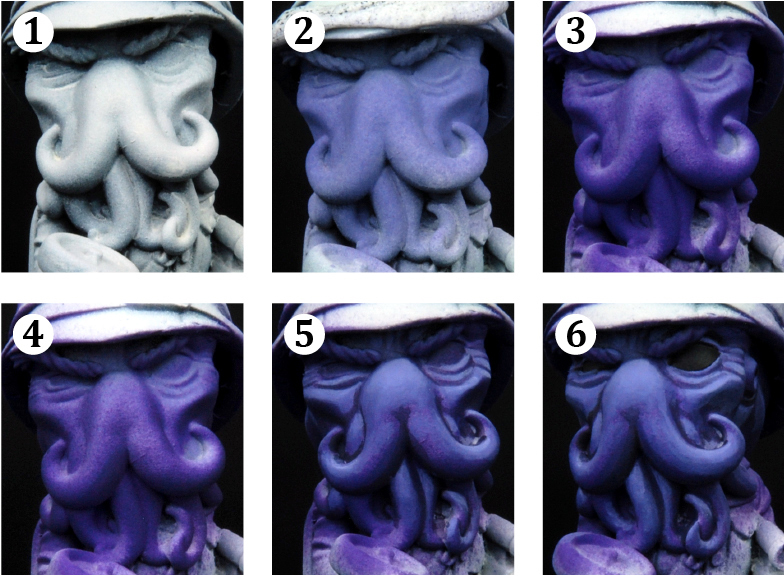 With a mixture of Violet SC-82 and Abyssal Blue SC-08 we shade thedeeper areas of the tentacles and wrinkles. We end up illuminating applying highlights with Bering Blue SC-06 and some White Sands SC-09. Apply a base layer with Abyssal Blue SC-08 and next coat the central area with Teneré Yellow SC-10 respecting the edges. With Black SC-00 we focus the gaze painting two lines where the pupils will be. With a glaze of Inktense Chestnut SC-81 we shade the outside area of the eyeball. With Purity White SFG-01 the eye’s shine is placed. Apply a base layer of Thar Brown SC-61. To lighten up we use Tenere Yellow SC-10 with the base color in the highest areas and we outline the seams. Finally with Violet SC-82 added to Thar Brown SC-61 and some Brown Leather SC-31 we apply one glaze to shade and to add a little color. We use this same mix to outline the lines of the hat. Apply a base layer of Ardenes Green SC-45 and Brown Thar SC-61 coating the whole fabric evenly. The next step is to keep shading and applying color progressively. For that, we use Ardenes Green SC-45 that we’ll darken with Inktense Chestnut SC-81 and some Violet SC-56. The last highlights are achieved by mixing Tenere Yellow SC-10 Thar Brown SC-61 and are applied to the top of wrinkles. Apply a base layer of Leather Brown SC-31. It’s not necessary to coat the area perfectly as we intended to simulate leather’s wear. To lighten we use Mars Orange SC-39 with the base color on the highest areas and we outline the seams. With a glaze of Inktense Chestnut SC-81 we intensify the color and we add a glossy touch to the leather. Finally with a mixture of Mars Orange SC-39 and Tenere Yellow SC-10 we apply a highlight on the most worn areas.